All services concern Cleopatra Marina; the public port offers just some water and electricity. Preveza is a small town located on the western coast of Greece, near Lefkas Island, Corfù, Paxos and Antipaxos. For its position, it's a good intermediate step for anyone sailing in this stretch of coast. Preveza raises at the entrance of a closed gulf, easy and nice to sail, rich of marine fauna (such as turtles and dolphins) and well-sheltered coves and bays. However, be careful inside the gulf since depth is very low especially along the northern coast and the entrance channel, where it is just 2 m and there are many insidious sandbanks. The entrance channel is well-signaled by buoys, it's half a mile long but rich of sandbanks. To make things more difficult, there are strong streams coming from all directions. Once you've arrived in Preveza, depth increases and reaches about 10 m near the promenade of the town. You can moor along the western quay or north of it, where a never-finished marina offers about 50 mooring places. On the eastern shore, on the contrary, Aktion offers three yards, one of which provides yachtsmen with 100 mooring places inside a small private marina. The cement quay running along the western shore forms the public port, located just on the foot of the town. Its southern dock extends from the end of the channel to a small pier marking the entrance of the never-finished marina. Here, depth varies from 1.5 to 3 m. The quay is rather high, so a lower area, signaled in yellow, has been created to receive all kinds of boats. The northern side of the quay is very crowded because, here, depth varies from 8 to 10 m and this area offers the best shelter against the north-western breeze which often blows, especially at night. The southern side of the quay offers no services, while the northern one provides with some water and electricity. 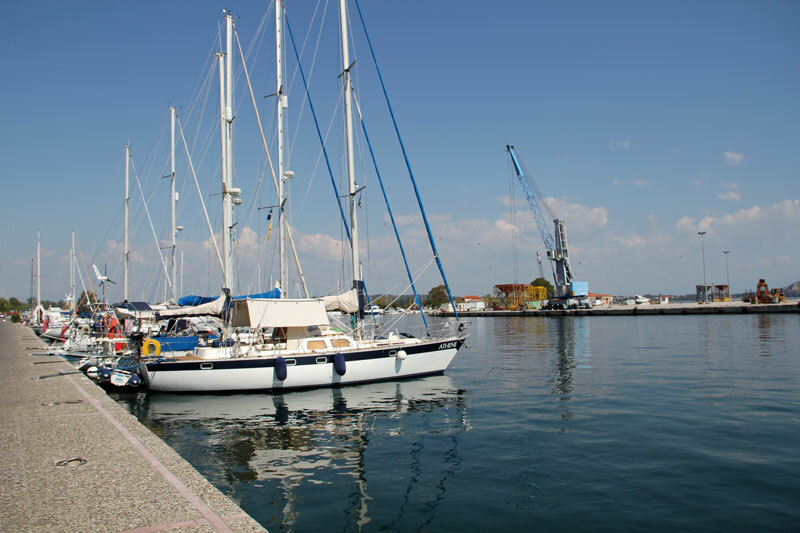 The other possibility offered by Preveza is that to moor inside the never-finished marina, at the northern edge of the quay and east of the commercial port. It offers 5 cement docks where boats can moor laterally. We suggest to put the bow westwards since the north-western breezes can be really annoying. The marina offers a sufficient shelter but southern and south-western winds are insidious anyway. The only services provided are water and electricity; daily fees are about 15 - 20 euros. As an alternative, you can choose the small private Cleopatra Marina which can receive about 100 boats up to 30 m. The average depth, here, is 8 m.
The entrance of the marina seems to be easy but, on the contrary, you have to take a narrow turn to enter the narrow passage between the breakwater and the pier, where stream are often strong. Please remember to call the marina on 67 CHF channel before entering. Mooring places are located in the inner part of the breakwater and at some mobile piers. There's a gas station, some water and electric charging columns, toilets, showers, a laundry and a real yard. The latter offers about 1000 dry mooring places, two travel lifts (300 and 500 tons), a crane (10 tons) and lots of yard services and technical staff. As regards fees, a boat whose length is over 10 m will pay about 40 euros a day in high season. The marina also offers some coffee bars, restaurants, taverns, chandler shops and shops. Preveza can be easily reached through an underground tunnel which links the two sides of the channel. Many buses and boats link the two shores.